Dr. Irving K. Barber, BSF’50, OC, OBC, the principal donor for UBC’s Irving K. Barber Learning Centre and a passionate supporter of education and research in British Columbia, passed away peacefully at home on April 13 at the age of 89. Ike, as he preferred to be called, was born on February 14, 1923, in Edmonton. He first came to UBC in September of 1945, having previously served for five years during World War II with the Royal Canadian Air Force, and graduated with a Bachelor of Science in Forestry in 1950. In 1952, he qualified as a Professional Registered Forester. He was involved in the forest industry in British Columbia for 57 years, working with people at all levels and throughout the province. In 1978, at the age of 55, he founded Slocan Forest Products Ltd. and over the next 23 years built it into one of the leading lumber producers in North America. He retired as chairman in February 2002. Ike was a visionary thinker with a strong commitment to strengthening BC, improving the quality of life for its residents and providing an enriched university experience for students. He had a life-long belief in the value of education and the importance of access to education, regardless of income, especially in remote communities of the province. He was closely involved with UBC both in Vancouver and in the Okanagan. The Irving K. Barber Learning Centre, to which he donated $20 million in 2006, remains a world leading facility and a hub of the Vancouver campus, and is accessible worldwide. 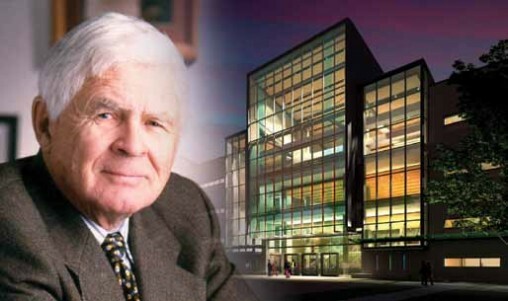 In 2004 he donated $10 million to establish the Irving K. Barber School of Arts and Sciences and the Irving K. Barber Learning Centre Interface Program at UBC’s campus in the Okanagan. Ike’s generosity has been instrumental in establishing programs to promote research, including the creation of the I.K. Barber Enhanced Forestry Laboratory at the University of Northern British Columbia, the Irving K. Barber Diabetes Research Endowment Fund at UBC and the Ike Barber Human Islet Transplant Laboratory at Vancouver Hospital in partnership with UBC. He received an honorary degree from UBC in 2002. Dr. Barber’s leadership was recognized throughout his career. He received numerous forestry and industry awards, and was appointed to the Order of Canada, the Order of British Columbia and the Canadian Business Hall of Fame. He is survived by his wife, Jean, whom he married in 1943, his three children, Linda (Brooke) Williams, James (Lynne) Barber and Gregory (Linda) Barber, nine grandchildren and 17 great grandchildren. The family has issued an open invitation to a ‘Celebration of Life for Irving K Barber’ on Monday, June 11, 2012 in the Old Auditorium from 3-4pm. The memorial will be followed by a reception in the Golden Jubilee Room at the Irving K. Barber Learning Centre from 4-5pm. All are welcome to recognize the life of this great Canadian, British Columbian and supporter of UBC. If you are unable to attend in person, the memorial will also be webcast live at www.ikebarberlearningcentre.ubc.ca.
. . . i just found out a few hours ago!!! ‘IKE’ was ONE OF THE BESTEST I Ever Met!!! very, very EXCELLENT LIFE ADVICE!!!! I AM A BETTER PERSON FOR KNOWING HIM!!! Our Best to Jean, and Family!!! !